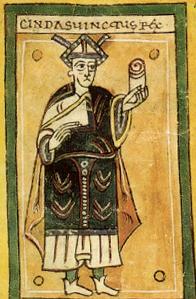 The Visigothic Code, also called Lex Visigothorum, is a set of laws first promulgated by king Chindasuinth of the Visigothic Kingdom in his second year of rule (642–643) that survives only in fragments. 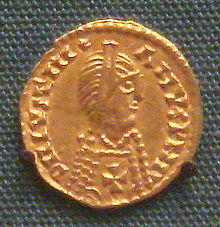 In 654 his son, king Recceswinth (649–672), published the enlarged law code, which was the first law code that applied equally to the conquering Goths and the general population, of which the majority had Roman roots, and had lived under Roman laws. The Kingdom of the Suebi, also called the Kingdom of Gallæcia, was a Germanic post-Roman kingdom that was one of the first to separate from the Roman Empire. Based in the former Roman provinces of Gallaecia and northern Lusitania, the de facto kingdom was established by the Suebi about 409, and during the 6th century it became a formally declared kingdom identifying with Gallaecia. 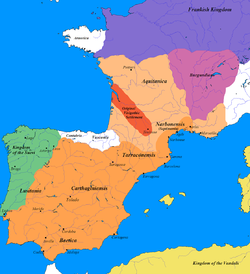 It maintained its independence until 585, when it was annexed by the Visigoths, and was turned into the sixth province of the Visigothic Kingdom in Hispania.